CarGurus has 1,043 nationwide IS 350 listings starting at $5,500. For 2017, Lexus gives its popular IS 350 luxury sport sedan a mid-generation refresh, with a minor exterior update and interior tech improvements. The 350 is the most powerful model in Lexus’ IS lineup, which includes the turbocharged 4-cylinder IS 200t and the all-wheel-drive (AWD) V6-powered IS 300. While the latter two sedans are relatively new models, the 350 traces its history back to 2006, when it made its debut as part of the IS's second generation. Now 4 years into its third generation, the 350 remains the anchor of the IS lineup. Sales of the IS 350 have spiked in recent years, thanks in large part to its bolder exterior styling. The distinctive front end, dominated by an hourglass-shaped spindle grille, hit a sweet spot with buyers, who drove up initial IS sales by more than 40 percent. Wisely, then, Lexus moved with caution when revising the IS 350’s grille and front end for 2017. In fact, unless you look closely, you might miss the subtle changes. The automaker moved the grille's two central points a little higher and tilted the top of the grille back toward the reshaped hood. These revisions create a slightly larger, lower mouth and a more uniform curved shape, which extends from the lower fascia to the windshield. Lexus also added new horizontal inserts to the grille for a more aggressive appearance. 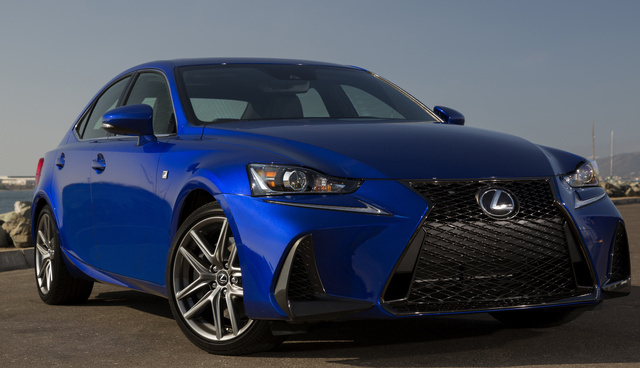 In addition, design engineers enlarged the IS 350's vertical front air scoops, reshaped and flattened the LED headlights, and extended the nose slightly for a sleeker overall look. Sharper side creases create stronger lines from front to back, while revised taillights and new rectangular chrome exhaust pipes help jazz up the tail end. New standard 18-inch alloy wheels and two new exterior colors, Caviar and Nightfall Mica, complete the list of exterior updates. Though subtle, the changes provide a cleaner and sportier look and bring the IS's styling more in line with that of other Lexus cars, like the ES and GS sedans and the RC sport coupe. The 2017 IS 350’s interior updates are similarly minimal but noticeable, and they focus primarily on the dashboard and center console. The most noteworthy change is the newly available 10.3-inch widescreen HD display screen, which is a definite improvement over the standard 7-inch screen—especially when using the optional navigation system. Some controls and knobs on the dash and center console, including the optional Remote Touch Interface controller, have been redesigned for 2017 to make them more user friendly. The speedometer, tachometer, cupholders, and dashboard stitching over the instrument cluster are among the other updated features. In addition, Lexus offers a new Chateau interior color. All the IS 350's other standard luxury features carry over for 2017, including power-adjustable sport front seats with NuLuxe faux-leather upholstery, a leather-trimmed steering wheel, dual-zone climate control, and push-button start. An 8-speaker audio system, a 7-inch LCD display screen, and a 60/40 split-folding rear seat are also on the standard equipment list. Available upgrades include leather upholstery, heated and ventilated front seats, a reversing camera, and a 15-speaker Mark Levinson Surround Sound audio system. As in previous years, Lexus offers an optional F Sport package for the IS 350, which replaces the grille's horizontal slats with a sporty black mesh screen and adds functional lower air ducts to either side of the grille to cool the front brakes, also with a black mesh screen. Other F Sport enhancements include heated front sport seats with additional bolstering, aluminum pedals, a sport-oriented instrument cluster with supercar-inspired digital gauges, and upgraded tires. In its standard configuration, the IS 350 rides on a rear-wheel-drive (RWD) platform, but owners requiring more stability and traction for inclement driving conditions can upgrade to the available AWD system. In both configurations, the vehicle sits on an independent suspension with a stabilizer bar and gas-pressurized shocks at the front and back. Power comes from a 3.5-liter V6 engine, which the IS 350 shares with the IS 300. While this powerplant produces 255 hp and 236 lb-ft of torque in the IS 300, the IS 350 boosts its output to 306 hp and 277 lb-ft for a more spirited ride. There’s plenty of power under the pedal for quick acceleration, passing at highway speeds, and making aggressive maneuvers. The IS 350 logs a 0-to-60 time of 5.6 seconds on the RWD platform and 5.7 seconds with AWD, and it can reach a top speed of 143 mph. With RWD, the V6 links to an 8-speed sport-tuned automatic transmission, while the AWD version gets a 6-speed automatic. Both transmissions include paddle shifters for manual gear changes. Fuel-economy numbers check in at 19 mpg city, 28 highway, and 22 combined with RWD and 19, 26, and 21 with AWD. In the safety department, Lexus adds its new Safety System+ package to the IS 350's standard equipment list for 2017. The package includes a pre-collision system, lane-departure alert with steering assist, automatic high beams, and radar cruise control. A full range of 10 airbags also comes standard, while a blind-spot-monitoring system with cross-traffic alerts is optional. Thanks to its recent upgrades and peppy powerplant, the IS 350 holds its own in a competitive class against challengers like the Audi A4, the BMW 3 Series, the Mercedes-Benz C-Class, and the Cadillac ATS. Owners and reviewers like its overall balance of comfort and performance, although some critics say it doesn't quite match the performance of a few of its top competitors. However, 2017’s upgrades should keep the IS 350 on the right track for the foreseeable future. What's your take on the 2017 Lexus IS 350? Have you driven a 2017 Lexus IS 350?